This fall, we decided to sprinkle some additional updates in, starting with a look ahead to this weekend’s big fall events. But before teams were sent off for disappointed drives home, two teams established themselves as teams to watch this spring: Northwestern NUT and the Wisconsin Hodags. In Power Pool B, Northwestern achieved a comfortable 4-0, winning every game by at least three goals. Taking home a fall win over Minnesota will be a nice pelt for the Great Lakes squad. Meanwhile, Wisconsin’s 4-0 came in a strong pool; most notably, they defeated Regional rival Carleton 12-10. Those two teams were just part of a day’s worth of storylines. Surprise Power Pool inclusion, UT-Dallas, held their own at 2-2 in Pool B; Kansas did the same in Pool A. Carleton and Minnesota’s only losses were to the aforementioned Power Pool winners. The Texan combo of TUFF and Texas A&M failed to register a win between them. Outside of the Power Pools, teams made some statements. Purdue, Iowa State, and Cornell were all Tier I undefeateds by day one’s end, while Wisconsin-Stevens Point, Colorado School of Mines, and Illinois went undefeated in Tier II. Top D-III program Air Force went 2-2, the same record as fellow D-III stronghold, Carleton GoP. Reigning national champion UNC is also the Fall Easterns champion, earning the title over a strong field. They faced off with host and rival UNC Wilmington in the final and won 10-8. Wilmington was coming off a hard fought double game point win over Georgia in semifinals. NC State was the fourth semifinalist but couldn’t make a dent against Darkside, who prevailed 13-6. It was an undefeated run through the fall event for heavily-touted UNC, which will only add fuel to the fire in Chapel Hill. They defeated each of the other top three teams–Ohio State in pool play, Pittsburgh in semifinals, and the youth club Triangle Tourists in the final–on the way to winning the tournament. It’s a great sign for a team that is integrating a lot of players into new roles. It was a solid outing for Ohio State, who fell to both UNC and the Tourists, but did earn a third place victory over in-region rival, Pittsburgh. Could Ohio State reclaim the Ohio Valley for its namesake state? While Sunday competition was rained out, if Saturday’s trends had held, we would have been treated to an exciting matchup between Texas and Carleton. They were both on the warpath on Saturday, carving through their competition in Power Pools A and B, respectively. Led by the handling of Caroline O’Connell, Texas’s 9-5 victory over Michigan was their closest match. Similarly, Carleton took care of business, only really challenged by fellow North Centralites, Wisconsin. For their part, the second finisher in each of those pools also looked strong. Wisconsin’s 3-1 record came without the benefit of Brittney Kokinos, though grad students Caitlin Murphy and Sabrina Hoffman, fresh off of club seasons with Madison Heist, were both major contributors. WashU took down some of the Great Lakes’ best, outscoring Michigan 10-6 and Northwest 10-5. Both of these clubs are hoping to be in the bid picture. The only non-Southeast team in the field marched into the heart of the region and took its fall crown. South Carolina took care of most of the region’s top teams on their way to winning the tournament in fairly dominant fashion. They narrowly defeated Georgia in semifinals, 12-10, before walloping Florida in the final. The Atlantic Coast is a deep region, but things are up in the air this season, with plenty of room for up-and-comers after heavy favorite UNC. The East, North, and South regions compete this weekend, while the Southwest is two weekends down the road. There are a smattering of college tournaments, such as the Savage New York Minute and Garden State this upcoming weekend. But here’s where eyes will be. Many of the top squads in the Southwest in both Divisions are headed to Sean Ryan this coming weekend. Hopefully, competition can take place as scheduled, despite air quality issues caused by the Camp fire. In the Women’s Division, UC San Diego, Stanford, UCLA, and Cal Poly-SLO are sending full squads, while Cal and UC Santa Barbara have split squads in the field. The Southwest had an impressive mix of teams throughout the top 25 last season. UCSD has a bevy of returners and is expected to be in championship contention this year. Stanford is used to that status as well, but a lot of veteran talent has left Stanford on shakier ground that they’re accustomed to. In the Men’s Division, Stanford and Cal Poly-SLO headline, but look out for both Cal and Utah, one of the few non-SW squads. Cal showed off some solid talent last year and has recruited well, positioning them as a Southwest sleeper. They travel to Classic City Classic in about three weeks as well, a sign that the team might be pushing for Nationals. Arizona might be a team to watch as well — they don’t usually travel to Sean Ryan. 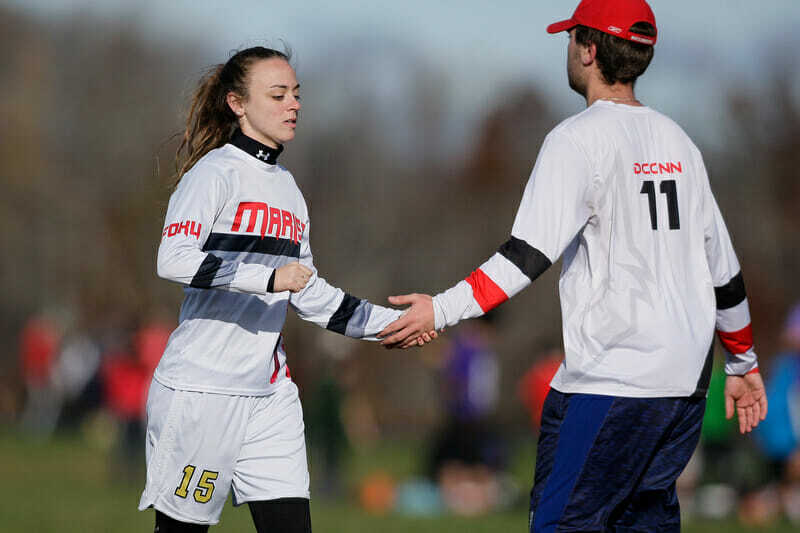 Teams playing this weekend may be without some of their top talent, as the East portion of the U24 tryouts are slated to take place, promising the best competition of any event this weekend. The tryout list was recently updated, including some un-snubbed snubs. The tryouts will be held just outside of Winston-Salem, NC; the West tryout is the following weekend in Tracy, CA. We’ll have on the ground coverage from both tryouts! Comments on "College Update: MLC Rainout, Blue Ridge Finale, Sean Ryan, College Mixed Regionals"